I believe Maui is one of the most beautiful places that I have ever laid eyes on. 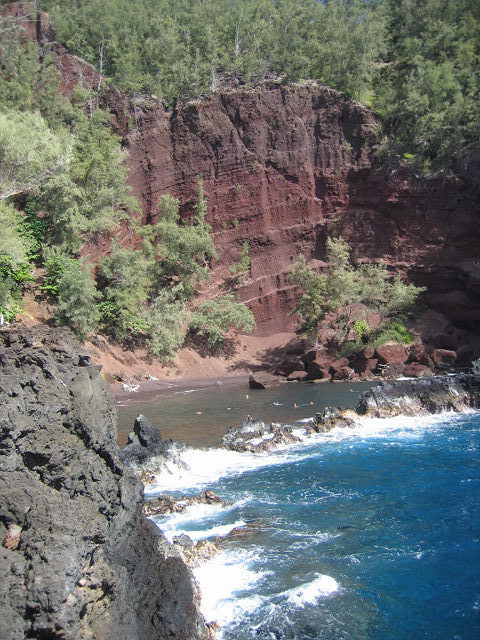 This beach is Kaihalulu, or Red Sands Beach, located south of Hana Bay. You might have to ask around, because the trail is kind of hidden, as well as a bit of a narrow path. I may or may not have fallen down while walking back from there. I remember the sand being a bit more coarse, but it’s great for exfoliation! You can float around in this cove, which is protected from the ocean by a natural wall rock formation but beware if you’ve got your mask and snorkel on, because it’s a clothing optional beach. I didn’t know this until I was a few feet from something I’d rather not be a few feet from, if you get my drift. If you ever get to Maui, I’d recommend this beach. It’s so beautiful, it will take your breath away! Wasn’t it?! My skin was so smooth after that beach from all of our ‘exfoliation’ hehe.